Jersey Airport is the sole airport serving the island of Jersey, the largest of the Channel Islands. Our Jersey Airport guide is a useful resource for travellers visiting the airport, with information regarding terminal facilities, public transport access and nearby accommodation options. The airport information desk is located in the Departures hall adjacent to check-in. From Saint Helier, head west along the A2 coastal road (Victoria Avenue). Turn right on to La Route de Beaumont, and after a short distance the airport is signposted on the left. The total drive time to the airport from St Helier is approximately 15 minutes. The airport is located about 7km (4.3 miles) northwest of the island's capital, Saint Helier. Bus:Bus service No. 15 (tel: +44 1534 828 555; www.libertybus.je) runs regularly from immediately outside the terminal. The single fare is £2 into Saint Helier, and the journey time is 30 minutes. Taxi:Cabs are available outside Arrivals. The fare into Saint Helier is approximately £12, and the trip takes 15 minutes. Companies operating taxis from the airport include Citicabs (tel: +44 1534 499 999), Domino Cabs (tel: +44 1534 747 047; www.domino-cabs.co.uk) and Yellow Cabs (tel: +44 1534 888 888), all of which can be booked in advance. An ATM dispensing both Sterling and Euros is situated beside the airport information desk, which itself also offers a limited currency exchange facility. There’s a coffee shop, a bar and a restaurant all within the Departure area of the airport, and another café in Arrivals. Duty free is available for all passengers leaving Jersey, and the large shop offering the full range of such items is open from 0545. Other shops offer a range of products including: newspapers, books, crockery, jewellery and health and beauty products. Luggage trolleys are available in front of the terminal, and in Arrivals. The Lost Property Office (tel: +44 1534 499 620) is run by the Boarding Card Desk located in Departures. Left luggage is also available in the Departures hall. Other facilities available at Jersey Airport include baby changing rooms, a children's play area (free buggies are also available) and a first aid facility. There are no meeting facilities at the airport, but many of the island's larger hotels offer these, notably the Hotel de France (tel: +44 1534 614 000; www.hoteldefrancejersey.com), which is a short distance from the airport. Free Wi-Fi internet access is available throughout Jersey Airport. Public telephones can be found in the terminal, and postal services are available at the information desk. The airport is fully accessible, with lifts and disabled toilet facilities. Designated disabled parking is available immediately opposite the terminal entrance. Any passengers who may require additional assistance are advised to contact their airline ahead of travel. 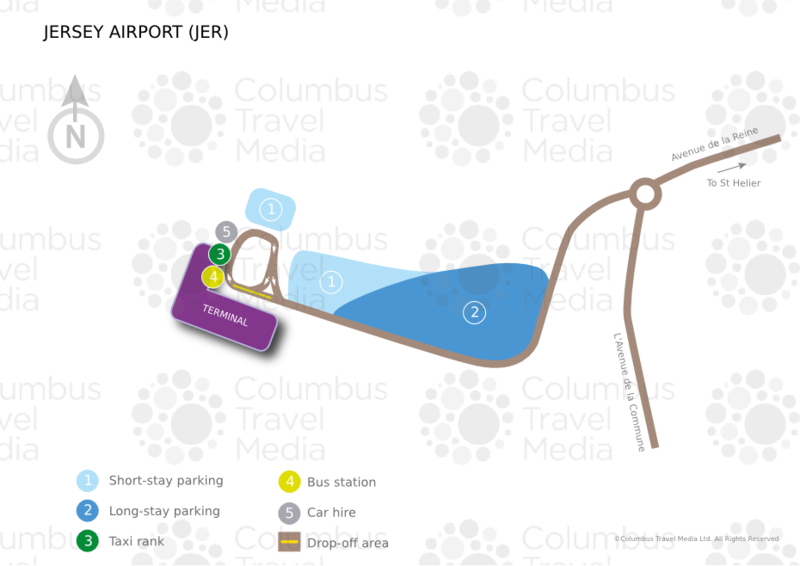 Long-term parking is situated in front of Departures, and includes the disabled parking bays. The short stay car park is located outside Arrivals. Car hire companies: Avis, Europcar and Hertz are represented at the airport. Offices are located on the ground floor of the terminal close to the entrance.